Coconut oil is one of the most popular, if not the most popular, hair oil used by healthy hair journey girls. Why? Coconut oil is commonly mistaken as a moisturizer, but in reality oils can not moisturize the hair because oil is not water soluble. How can something that doesn't contain water moisturize the hair? Moisturize means adding moisture--the presence of water. The reason coconut oil is commonly confused as a moisturizer is because of it's unique properties. Out of all the oils, coconut is the most penetrating and nourishing, the closest thing to an oil being moisturizing. Another unique benefit of coconut oil is its ability to retain the protein in hair. This is great for anyone with chemically treated hair. This is because protein is lost during chemical processes, especially with hydroxide relaxing. Regular protein treatments must be done in order to restore our hair's keratin and using coconut oil helps make the protein fillers last longer. There are two brands of coconut oil I use: Dabur Vatika Coconut Oil and Hairveda Vatika Frosting. DABUR VATIKA REVIEW: You can say that Dabur Vatika is the original, because Hairveda's was created as an alternate and improved version made for afro textured girls. 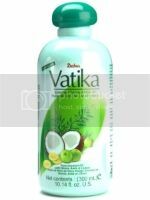 Dabur Vatika is an Indian hair oil that can be found at almost any Indian market. It's made with a ton of ayurvedic goodies like neem, brahmi, amla, henna, milk, rosemary oil, and lemon oil. This coconut oil is also known for it's distinct smell. To me, it smells like a coconut soap. While it bothers some it doesn't bother me at all. I quite like it! It smells natural--not like a coconut fragrance, but actual coconut. Dabur comes in different sizes, but I usually get the one like in the picture above. In room temperature coconut oil is solid. how do they expect you to get a solid out of a bottle? The Dabur bottle is microwave safe so that the oil can easily be heated and turned to liquid. I usually heat mine for 15-20 seconds, more if I'm doing a hot oil treatment. The Dabur Coconut Oil I mainly use as a hot oil treatment and prepoo ( before shampooing treatment ). Everyone's hair responds to products differently, and I believe my hair likes it better as a hair treatment and with heat rather than as a sealant. I also like the application of the bottle. it's made so that the oil comes through a tiny punctured hole. This is good because a little oil goes a long way. I only need a drop or two of oil to lightly coat my strands, and that's coming from someone with a lot of hair. The other, more important reason I like the bottle is because it works as a dropper so I can pour it directly on my hair without it getting messy. Putting product directly on your hair, rather than from your hands, has a better effect. I can always feel the difference. This is how I see many girls of Indian heritage oil their hair. 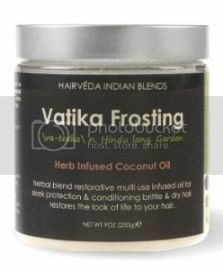 VATIKA FROSTING REVIEW: Hairveda's Indian inspired products are more suitable for dryer and curler hair types. Like Dabur it's completely natural and made of ayurvedic goodies, like amla, henna, and lemon. Unlike Dabur Vatika their container is in a jar and not microwavable safe. But there is no need to heat it, just take a scoop of the solidified oil with your finger and lightly spread it in your hand before your hair. It will melt instantly due to your body temperature. Also the smell is greeeeat! It smell's like homemade cake frosting! One of my best smelling hair products. All of Hairveda's products have great smells. and also like Dabur Vatika, a little goes a long way. I've been using the first jar I bought for more than a year now, maybe even two? It also lasts longer than my Dabur Vatika. but that might be because I use it as a sealant rather than for oil treatments, and treatments take more product. Though I might use Dabur as a sealent when I need something lighter or when my hair is getting too shiny, I prefer Vatika Frosting as a daily sealant because it gives my hair more shine and moisture retention.